I was reading a site about precious metals the other day and a guy said he got a free palladium coin. That can't be, you say! That's what I said. How can you get it for free? I'll take all I can get for free! So, I read further. Come to find out, the author said he was looking for some silver coins. He went to local coin shops and everything and they had only a few each. 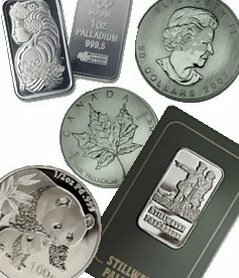 Silver was worth about $12/oz at the time, and they were charging anywhere from $15-20. So, he bought if the premiums were low enough, but mostly, he didn't want to waste his money. But, he knew he wanted coins, and about 20-30 of them. So, he found someone on ebay who was selling a mixture. There were 10 silver coins, and they were mostly Eagles of different years, but some had pictures of Santa Claus or baseball players on them. They weren't in great condition and the price was only around $150 after shipping so he went for it. There, he had 10 more silver coins along with the few he bought locally. I'm guessing, but we'll say he got his 20 silver coins total. However, when the Ebay shipment came he found he was shorted an ounce of silver! There were only 9 silver coins. To his astonishment, there was a Canadian Maple Leaf Palladium in there! It's smaller, but a bit thinker, so I guess the seller just assumed it was an oz of silver. Lucky! Anyway, that's a wishful story, huh? I hope I'm someday that lucky. Just thought I'd share it!